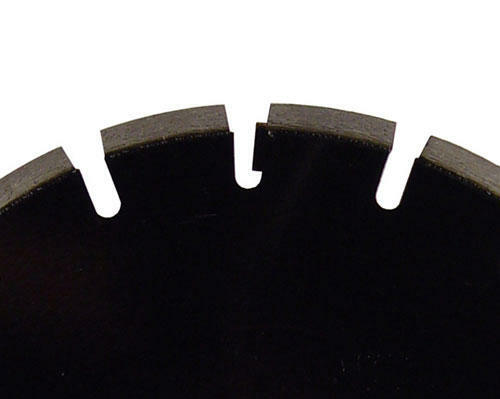 The SA Series Segmented Blades are best suited for highly abrasive materials, such as asphalt and green concrete. To protect against segment loss and excessive wear on the steel core, these blades are outfitted with undercut protection. 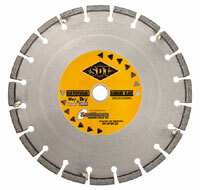 The SC Series Segmented Blades are designed for cured concrete with medium to hard aggregates. Cured concrete is generally concrete that has been allowed to set for more than 7 days. The SM Series Masonry Segmented Blades are designed to provide maximum cutting performance on hard materials such as hard bricks and medium-hard materials such as blocks. The ST Series Masonry Turbo Segmented Blades excel at fast, aggressive cutting of masonry and concrete materials. These high speed blades are commonly equipped on handheld chop saws. Turbo style segments facilitate cooling for prolonged, under load operations. The SG Series Multiple Purpose Segmented Blades are designed to perform at peak efficiency for a variety of applications. The blade utilizes laser-weld technology to ensure that the segment bonds have greater heat resistance in order to cope with the heat during dry cutting operations. 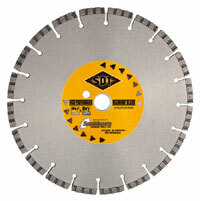 The SN Series Laser-Welded Segmented Blades are ideal for cutting natural stones and medium-hard aggregates. The SB Series Laser Welded Segment Blades are best suited to cut brick & block and other aggregates with similar properties. The large U-shaped, angle slots are designed to quickly expel dust and to increase air flow for more efficient cooling during dry cutting operations (although wet cutting is possible as well). 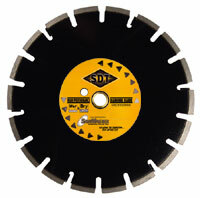 The PSM-D Series Segmented Blades are general purpose, dry masonry blades for use with table saws (that operate at a lower RPM than high-speed hand-held saws). They can be used with bricks of varied hardness. 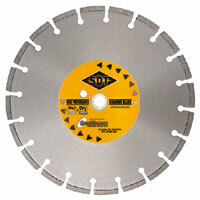 The PSM-W Series Segmented Blades are general purpose, wet masonry blades for use with table saws (that operate at a lower RPM than high-speed hand-held saws). They can be used with bricks of varied hardness. The PHS Series High Speed Dry Cutting Segmented Blades are designed for use with hand-held electric or gasoline-powered saws with a maximum spindle RPM of 6000. They are suitable for cutting both abrasive and non-abrasive materials. 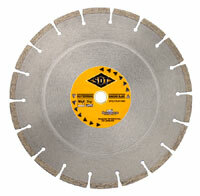 The PSC Series Segmented Blades are designed for walk-behind saws that wet cut cured concrete. The PSA Series Segmented Blades are designed for high speed handheld saws and walk-behind saws that cut green concrete and asphalt. To protect against segment loss and excessive wear on the steel core, these blades are outfitted with undercut protection. The PWB Series Segmented Blades are intended for walk behind saws with motors rated up to 18 HP and that operate under dry cutting conditions. 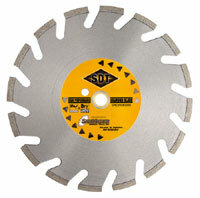 The SS Series Segmented Blades utilize silver solder technology to maximize use of the entire height of the segment. 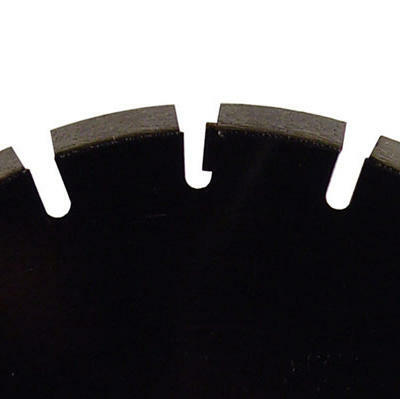 These blades are aimed at stone and floor tile applications on wet tile saws. The SR Series Segmented Blades are cost-effective blades intended for single use or for small jobs, especially in the DIY market. The sinter manufacturing process enables the use of the entire segment, much like sinter blades for an even lower cost-per-cut.